The Range Rover Sentinel gets a power boost in the form of Land Rover’s 5.0-litre Supercharged V8 petrol engine, replacing the earlier V6 motor. Also gets crucial safety upgrades. 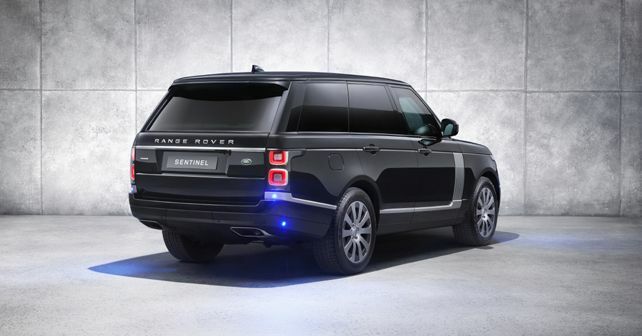 Land Rover's Special Vehicle Operations (SVO) division has just made the Range Rover Sentinel more powerful and updated it with the latest in occupant protection. Now featuring Land Rover's 5.0-litre supercharged V8 petrol motor with 375bhp, the updated Range Rover Sentinel gets a 39bhp power boost over the preceding V6 version. Despite packing in about a tonne of armour plates and glass, the Sentinel is capable of doing the 0-100km/h run in 10.4 seconds, with a limited top speed of 193km/h. In terms of passenger safety, the Sentinel is fitted with armoured glass in order to help protect occupants from an attack. A further list of security systems includes the option for a specially-configured front window which drops a maximum of 150mm for document delivery, while it also features a public address system allowing occupants to address people outside the vehicle without leaving their secure environment. As standard tyres remain most vulnerable in case of a blast/attack, the Sentinel also gets specially-manufactured wheels which incorporate a run-flat system, allowing the car to be driven over distances of more than 50km at speeds of 80km/h even if a tyre is damaged. Further, the chassis, suspension, braking and electronic stability systems of the Sentinel have also been updated to retain the Range Rover's on-road dynamics. The Sentinel also gets an 850mm wading depth to cross difficult water-filled stretches with ease. Accompanying the armoured glass and run-flat system are a blast-protected roof, under-floor blast protection, certified fragmentation protection (capable of shielding the car from IED blasts as well) and an emergency escape system (allows occupants to escape through the tailgate in case all doors are rendered unopenable). Despite being a purpose-built creation, the Sentinel also offers the same levels of luxury and refinement inside as any standard Range Rover. The Sentinel comes fitted with Land Rover’s latest Touch Pro Duo infotainment system with two 10-inch high- resolution touch screens. Exterior styling includes LED lighting and an optional Black Pack.